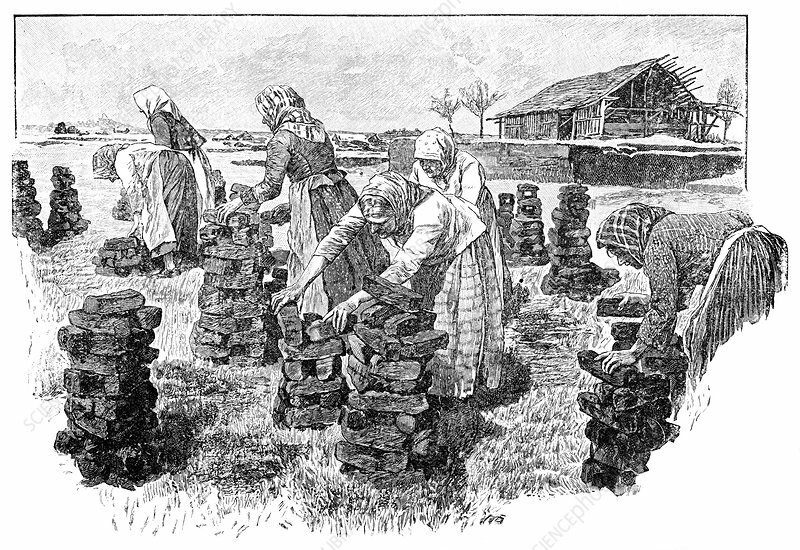 Workers drying peat, historical artwork. Peat, a solid fuel dug from the ground, is formed from compacted ancient organic matter, including plants such as Sphagnum (peat moss) and Carex (sedges). Locations where peat is commonly found includes Ireland and the Somme Valley in France. At the time of this artwork, some 800 bogs in France produced around 250,000 tonnes of peat, employing around 28,000 workers. Artwork from the third edition of 'Les Entrailles de la Terre' (1902) by French author Eugene Caustier.